"Spring into Service" in Romania!! 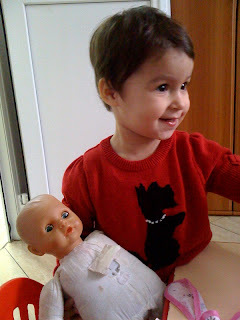 A special little girl named Andreea, who lives at the Tutova Clinic in Romania, just turned two. Her smile is heartwarming and her giggles fill up the room. At this time of Thanksgiving, she reminds us why we work together to serve children who live in hospitals and orphanages, students who wish to learn conversational English, and communities worldwide who invite us to lend a helping hand. From November 15 - November 21 the Star Tribune newspaper is holding a contest entitled 'Full Page Project' amongst MN non-profits and the winner will receive a free full page ad in the paper! We would also encourage you to pass this link along to your family and friends, and post it on your personal Facebook page. Let us know if you have any questions, and remember voting has begun! Exactly one week ago, we were arriving in Tutova with a new team of volunteers after a long day of driving back and forth to Bucharest. We are a team of six women, four of us being returning volunteers. The other three returners were here in October of 2008. Four volunteers are here for two weeks, and the other two of us will be here for the full three weeks. It is finally spring here! We have experienced mostly sunny days in the last week, and everything is in bloom, which is beautiful. The road from Tutova to Barlad is surrounded by fields of yellow grape seed flowers, which we are told are used to make oil for paints, cars, and planes. The high temperatures this past week were between 16-22 degrees celcius. Friday marked the first day that we were able to take the children outside without hats and coats, which was very exciting! Our team of six is split into two groups of three to work in the two playrooms at the clinic. In total we have 20 children. Three children are above age three (3, 3, 7), 7 children are two years old, 4 children are one year old, and 6 children are under age one. I am in the group volunteering with the non-mobiles, which includes children from 5 months old up through 3.5 years old. The mobile group has mostly toddlers, but includes children from one year up through 7 years. Within the non-mobile group we have three children in isolation, so we split our time between the playroom and the isolation rooms to work with all the children. In the last few weeks we have seen three children leave the clinic. Two children went home to live with their families (Andrei and Denisa), while one went to live in an institution for older children (Sammy). We have also seen the arrival of a new baby (Nicoleta the 5 month, 5 pound, wonder), and the return of another baby (Daria was away for a week for cleft lip surgery). I have been able to meet parts of the families of Andreea/Roxana, Roxana, Celine, Daniela, Andrei, Nicoleta, Daria, Petre, and Andreea. I was also fortunate to be able to spend my 19th birthday here with the children. I was very happy to have my party at the clinic and to be able to share cake with the staff and the children. This weekend another volunteer is celebrating her birthday with a trip up to the painted monasteries. There is nothing better than celebrating surrounded by the Tutova babies! I have also been lucky enough to celebrate some of the children's birthdays with them. Since I arrived in March we have celebrated Marius, Gabriela, Mihaela, and Petre! Seven weeks of my trip are now finished, and only two remain. I feel so lucky to have been able to spend an extended period of time here with the children. It really gives you the opportunity to get to know the children and staff, and to understand how the clinic and the community work. Three of us were joking last night about how we feel like the luckiest parents around; we have 20 children, yet we are off duty at night and not required to change diapers or do laundry! We have the chance to spend all our time and energy focusing on the happiness and development of the children, and with that we see growth. A little background on the kids that come to the Failure to Thrive/Pediatric Recovery Clinic. When Romania joined the European Union in January 2007, the EU named the county that the clinic is in, Vaslui, as the poorest county in all of the EU countries. It is a rural area, where some people still get around with horse and cart. Actually, it is quite lovely to see...you feel like you have stepped back in time. In Barlad, the closest city, there are excellant schools that lead most kids to a university education. However, in the small villages that surround Barlad, it is not uncommon for kids to drop out of school at a young age. Many times to work the land or to get a job to help the family. Often when a child is born with a disability in these small villages, the family doesn't have the education or financial means to take care of their child. At the clinic, we have kids with Down Syndrome, Fetal Alcohol Syndrome, Autism, club feet, cleft lip and palate, brittle bone disease, heart disease, malnutrition and neglect. Surgeries are performed on the kids that require it. Many kids are brought in voluntarily by their parents because they can't care for them. Families do visit as often as possible- around once a month to once a year. The poverty level in the area is high so it is difficult for parents to take time off of work and to pay for transportation to and from the clinic. Other children are brought to the clinic by Child Protective Services because they have been abandoned at the hospital or taken from their home due to bad living conditions. Currently, the age range for the kids at the clinic is four months to six years old. People often ask me if it is sad volunteering in Romania. Yes, it is sad that these kids aren't growing up in a healthy, home environment but the clinic and Global Volunteers does the best they can to make it a positive situation. The clinic is bright, with cheerful drawings of cartoon characters on the walls. The metal cribs that many of us have seen from TV shows in the 90's are now bright cribs of blue, yellow and red. There is lots of laughter and fun. When a child runs into your arms, excited to see you or you soothe a crying baby, you know you have made the right decision to come here. One of my favorite quotes is,"If you think you are too small to make a difference, then you have never been in bed with a mosquito." Our help may be small and for a short period of time but it makes a difference in these children's lives. I thought I would blog tonight for those of you who are thinking about signing up for the Romanian trip and want to know what a typical day is like. 8:00am-8:45am- Breakfast and reading of the team journal and the quote of the day. 9:00am-12:30pm- We leave for the clinic, about a three minute walk. Our first feeding is around 9:30. The non-mobiles usually have bottles and the mobiles we feed a chicken, potato and carrot puree from a bowl. Messy! The rest of the morning is play time. We play games, dance, practice sitting, crawling and walking, work on basic Romanian words and generally do things to stimulate the kids. Regarding Romanian words, we all get a laugh when we say "pa" to the older kids and they reply with the English translation of "bye"! The kids have also picked up on "uh-oh" and say it throughout the day! We have a snack around 11:00am, usually yogurt and fruit puree. Diapers are changed after that and then around noon, lunch is given to the kids, most often a repeat of breakfast. 12:30pm-2:45pm- Time for our lunch back at the hotel. We then have free time to rest, take a walk, do laundry, etc. 3:00pm-6:30pm- Back to the clinic to wake the kids up from their naps and to feed them again. Maleka, the amazing nursery school teacher, is with the older kids during the afternoon. We help her with the older kids, go to the non-mobiles room to play with them or sometimes help the aides fold mounds and mounds of cloth diapers. If the weather is nice, we also spend as much time outside as we can. Diapers are changed again around 4:00pm and then we feed the kids dinner around 6:00pm. Diapers and feeding are usually every four hours. 6:30pm- We have dinner at the hotel. On Tuesdays and Thursdays, we go to Barlad to have dinner at a restaurant in the city and a stop at the grocery store. Then, collapse into bed! That time for me is now.......good night! Friday was the last day for the members of our team that were spending one week here at Tutova. The day was filled with the usual feedings, diaper changings and play time. Last minute pictures were taken by the people leaving, wanting to preserve the week's memories. In the afternoon, we had a little party at the clinic as a thank you to the aides and nurses and a goodbye to our new friends. Several of the kids, who woke up early from their afternoon naps, joined us in the festivities. Many delicious cookies were eaten and a few tears were shed as people prepared to say goodbye. Several people talked about what a life changing experience this has been for them. Dr. Delia, who is the head doctor and runs the clinic, stopped by to say thank you and to answer questions. Dr. Delia came to the Tutova clinic and hospital in 1989 for a six month stay and has never left. Her devotion to the clinic and hospital is amazing! We had our last full team meal together on Friday night, pizza and Romanian cheesecake. Many of us stayed late to talk about the week, laugh and to toast Romania with a shot of Tuica, the Romanian liquor. Saturday morning, six of our team members left. They will all be missed but especially Terry, our one guy, who provided us with laughter and was a true gentleman to all of the ladies on the team. Several people went over to the clinic on Saturday and Sunday. The weekend staff is just one nurse and one or two aides- for 22 kids! It is always busy and they appreciate the extra help. Kristen took a day trip to see Dracula's castle and Brasov. Michelle, Caroline and I went with Mihaela to visit Ionela at her home. Ionela was at the clinic for two years and is one of my favorites. She was born with a cleft lip and palate. Her parents were not able to take care of her so she came to the clinic. Most of the children at Tutova do have parents but because of the children's disability or poor living conditions, they can't stay in their home. Some of the parents stay involved in their children's life while others become wards of the state. Ionela had several surgeries to correct her cleft lip and palate and last December, went back home to her family. It was wonderful to see her smiling face and funny laugh. Both she and her family seem happy to be back together again. We six remaining team members are rested and ready for a busy second week!! My name is Caroline, and this is my seventh team in Romania with Global Volunteers. This is my second time doing an extended stay in Tutova, and I will be staying for nine weeks. I am very excited to share my experiences with you all! Today it was warm enough to take most of the kids outside! Many had not been out for several months so the bright sunshine and cool temps were a bit of a surprise for them. Romanian culture is not too big on having kids out in the cold. In fact, regardless of the tempurature, Romanians don't want children in a room that has the door open and a window open. One is fine but not both. Many believe that the draft from having both open may cause colds. It is alway fun finding out the nuances of different cultures around the world! Anyway, we bundled the kids up in the winter clothes and took them out for walks. Some kids in strollers, some teetered along and some were carried. We had fun trying to stay out of the mud (not always successfully), exploring the grounds of the clinic, picking up twigs and pinecones and feeding treats to the hum hums (dogs). Here's hoping for another sunny, not windy day tomorrow so we can get outside and explore further! Happy Birthday Mihaela, Gabby and Marius! Today is the twins, Mihaela and Gabby's, second birthday. It was also Marius's second birthday last week so we celebrated all three birthday's today. We brought a DELICIOUS birthday cake (thanks to our team leader Mihaela), had new birthday outfits for the kids (thank you, Lauren!) and a happy birthday banner to make the occasion. We sang Happy Birthday in English and the aides sang to them in Romanian. It was fun to hear the different birthday songs in the different languages. Little Mihaela even gave us her best dance moves in honor of her big day! The kids seemed in much better spirits today. I think getting back to their usual routine (having many volunteers around) was great for them. Walking in to the clinic and having the kids smile and reach out for you and climb all over you and sometimes be a little naughty -"no hair pulling, Sami! "- is such an amazing feeling. It makes my day and brings joy all around. Our team seems to be blending really well. Many of us stay after meals and continue our conversation. I find it interesting that 48 hours ago most of us were strangers and now, because of this shared experience, we are laughing at each others dumb jokes and carrying on like old friends. Three of the women on the team I have served with before and it has been great catching up with them. On a side note, the Romania program has one of the highest returning volunteer rates of any of the programs. I have also made two new four-legged friends- well one is three legged. There are two darling dogs who hang out around the hotel. One looks like a pure bred yellow lab who only has use of three legs but gets around just fine. The other is a spunky true mutt. The team has been very generous with left-overs so they are going to bed very happy- like me. Our first day is mostly orientation. We all got to know one another a bit more, set individual and group goals, learned about Global Volunteers policies, had a Romanian language lesson (the other diners at the restaurant where we had our lesson got a kick out of us trying to roll our "r's") and received our room assignments- either the non-mobiles or the mobiles. We also were able to spend time over at the Failure to Thrive/Pediatric Recovery Clinic. I was last here in November 2009 so I was anxious to get over to the clinic and see my kids! This is the first time that I have been here when there hasn't been a team for the three weeks before us and I was surprised at what a difference I saw in the kids. Many of them seemed withdrawn. Caroline, who is a current volunteer and was also on a team last month, said that she noticed regression in some of the kids. If ever I needed reminding what a difference we make, this was it. I may not, specifically, make a difference to these beautiful children but having the continuity of volunteers here does have a huge impact on their lives. Of course, I would like to think that I personally do make a little difference. They sure have all made a difference in my life.